I love the Word of God. It can be challenging, frustrating, confusing, even boring sometimes (sorry, but I can only take so many genealogies, although I appreciate their significance!). But the Bible also surprises, encourages,uplifts, teaches, comforts…CHANGES us! And the sooner my kids learnt to love God’s word, the sooner they will benefit from the underpinning of truth that the Bible can give their lives. Starting with the youngest children Tiny Bear’s Bible is a wonderful bible story book which babies from about 6 months can enjoy. The first thing our tinies loved about it was the fluffy teddy bear cover. Beyond the externals though, this book of 12 key bible stories is well thought through. When our two were babies, we just read the heading on each page and, as our children grew, read out each story. The stories are in verse format but are not at all “fluffy” theologically. Each page also has an application for ‘Tiny Bear’, such as being encouraged not to be fearful after the story of Jesus calming the storm or remembering God is always with us after the story of Daniel in the lion’s den. The Easter story is beautifully handled for this very young age group and simply says “God makes Jesus alive again!” with a picture of Mary meeting and worshiping Jesus in the garden. There is no direct reference to the crucifixion. My only criticism would be that the pictures, while beautifully created and rather whimsical, are a little soft, fuzzy and over-detailed to be clear to a baby’s developing eyes. As they got older though, my toddlers loved picking out the anteater in the Creation story, the flamingos on Noah’s Ark and the fox in the garden with Jesus.This bible is suitable up to about age 3. It is available in a pink or blue version and makes a lovely Christening present. The Beginner’s Bible was the next step for us. With around a hundred key Bible stories, each given three to four pages, it is a well-produced and comprehensive introduction to the Bible. The pictures are clear, bright and fun and the language males it accessible for the 3-7s, although 2s and up will get the gist of it. Stories with some gore involved, such as David and Goliath, are handled matter of-factly and without upsetting pictures. The crucifixion shows silhouettes from behind the cross and another picture of Mary crying by Jesus’s feet. There are also many linked and supporting resources such a a Bible study series called Beginning-with-God and linked materials for churches to use. The IVP website says this is the most popular children’s Bible of all time. I wouldn’t be surprised. It’s a winner. My son, now three, has also enjoyed The Baby Bible. It makes a good stepping stone between Tiny Bear and the Beginner’s Bible, There are around 20 stories told in (mostly) simple language and the art work is really superb – clear but appealing to the adult eye as well in its beauty. It would also make a good christening present but I would argue it is more suitable for toddlers. For 3-6 year olds, a great choice is the Children of God Storybook Bible. The 100 or so stories are retold by Archbishop Desmond Tutu in simple language, always followed by a simple prayer which creates an application to the story, e.g. “Father God, help me to love those who are hard to love”. Each story is on its own double spread and is illustrated by a different artist. The artists came from around the world so the images are not only diverse and of extremely high quality but the styles and characters reflect different cultures from around the world. I’m a sucker for beautiful artwork in books anyway but the stories are really well told too and an audio CD version is also available. Both the hardback book and the CD are superb value. The Jesus Storybook Bible is one which gains rave reviews all over the place. It’s suitable from about age 5-12. We have it and I rate it but I also have my reservations having read it through with my daughter. With the books I’ve mentioned above, it is clear they are collections of Bible stories for children, rather than complete Bibles. It’s not so clear with this one. I like that it has an overall narrative and shows the clear flow of the redemptive story from creation through to Revelation. I think it is a valuable resource in that sense. However, it is an interpretation of the Bible and one with a specific theological slant. It’s a slant I actually agree with but I’m uneasy with packaging the interpretation along with the story without reminding people of the fallibility of human understanding. In terms of the detail, my husband pointed out that, for instance, the crucifixion narrative adds in far more gory detail than is actually given in any of the gospel narratives and it is, although probably correct, essentially conjecture. It’s an uncomfortable halfway house between bible story collection and bible translation for me. I also didn’t much like the artwork but that’s personal preference. Do check it out if you have kids that age but it might be worth supplementing with another bible or bible story book which doesn’t add its own interpretation in. I do know families have used it during Lent or Advent (you could use it with a Jesse Tree for instance) but it needs a little care. I’ve mentioned the Dinnertime Bible before. It’s suitable from about age 4. I can’t imagine using over the table but that may just be the chaos of mealtimes in our family. As a conversation starter, a useful “plug-and-play” family bible time resource or even a bedtime bible devotional with your child, it’s a great read with smart pointers for parents and elements which would make it work with a mix of ages in your family. Colourful, well thought-through, excellent value. I like it a lot. 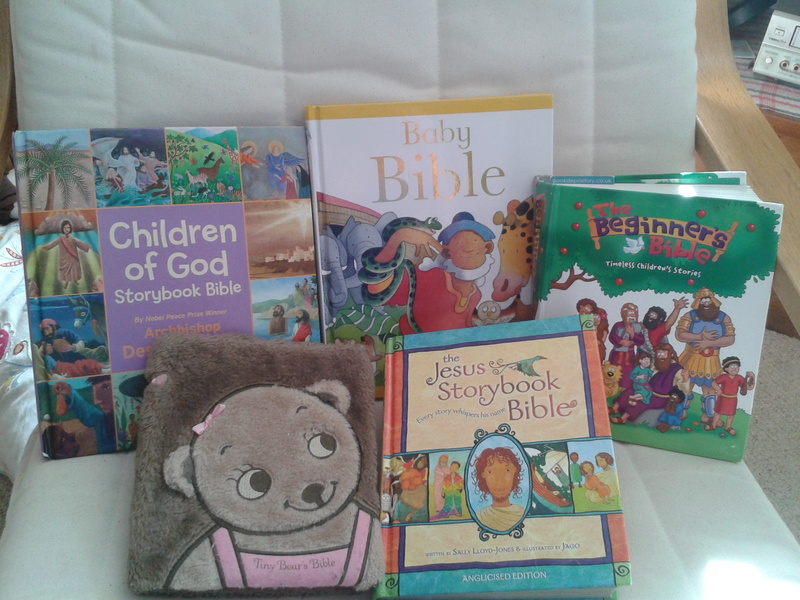 So, that’s my selection of bible story collections for young children. You might also be interested in my post on learning Bible verses through song. Now it’s your turn. Which children’s bibles do you rate?